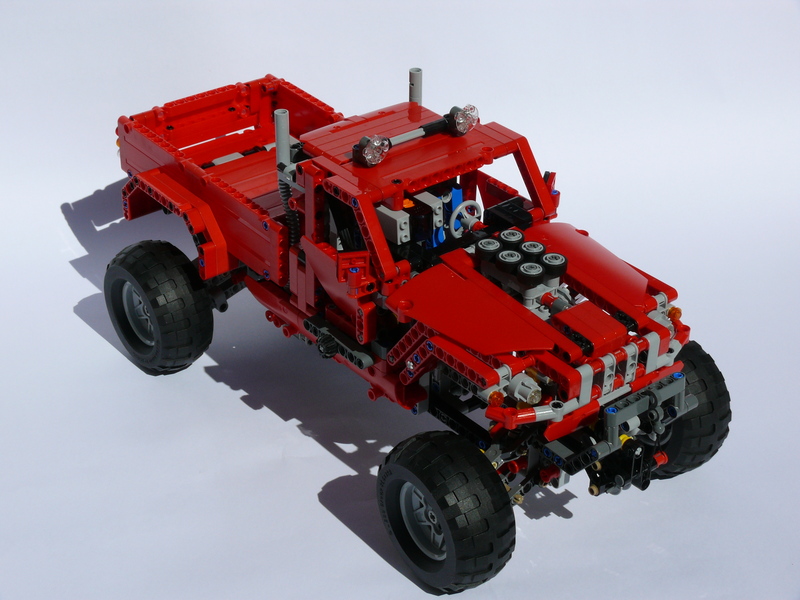 The 42029 Pick Up has been one of my favorite designs as soon as i saw it. It’s a rather small kit, only 1060 parts compose it. 3 main functions, a front winch, a tipping bed and a hand of god steering to manipulate the truck, all of them are manual. The instructions integrate a guide that allow you to add a motor and a battery box to the winch and the tipping bed. Those functions are basic and not really playable, the choice of a tiny actuator for the tipping bed won’t allow heavy loads, and the winch is funny… few minutes. Poor functions perhaps, but what a look ! The choice of the red color makes it aggressive and the huge cabin and its impressive guard gives a good impression of power. 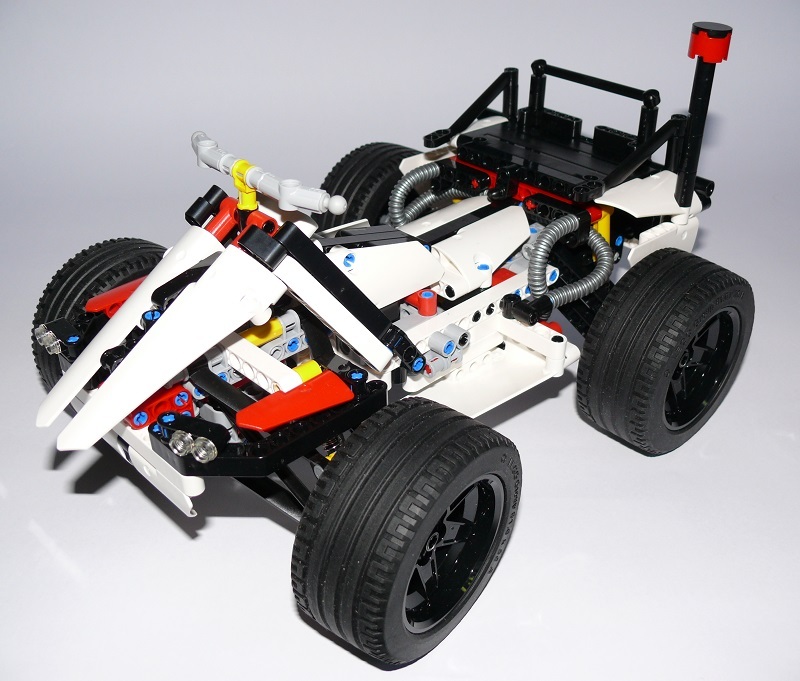 So, no need to argue much, the decision to build it again and to add motors to its chassis was taken in 10 minutes ! 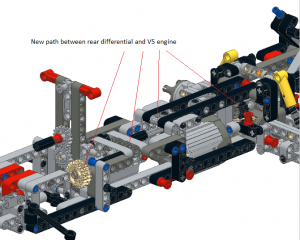 – An XL motor for the propulsion, it has lots of torque and won’t require much gearing down like the other motors would need. – A servo motor for the steering. First, I checked how much rotation was need to steer the front wheels from center to the sides and the servo motor was offering me exactly what I needed, with the big gain of offering an automatic return to center, which makes the driving much more easy from the remote controller. For the building, I took the original instructions and built the model, then, when the chassis was made, I started to examine it from close to find where to add the motors. The main problem was to keep the V6 engine operational whereas it was located very far of the rear axle. I did this by creating a new path between the rear differential and the front of the truck, going just over the 2 motors that I positioned the lower possible, to hide them and keep the original look preserved. This task asked me to remove lots of pieces and replace them by the needed ones. Once the parts originally needed for the steering removed, most of the job was done and I could finish the entire build. The end of the assembly was a kid game, since I kept it as close as possible of what it was at its origin, I had no difficulty to finish to build it with the original booklets. The very last modification concerns the roof which now has to support the infra red receiver, settled inside the cabin. I’m pretty happy of that moc because it’s not distorted by the modifications made, and it’s really playable. My son and I played a full afternoon with it trying to film ourselves to build footage for the Youtube video to come. Thank you for your post. I sent it to you by email. Ohh. Thank you very much. The LXF file download link returns 404 error. Can you fix the issue or also send the file to my email address? Thanks. Hi I own this model and I am looking for this kind of mod to it. I like yours very much, great work. I wanted to ask regarding extra parts needed to “upgrade” the model to RC version. Would you have a list by any chance? Thank you. Hello Milk. Thank you for your message. 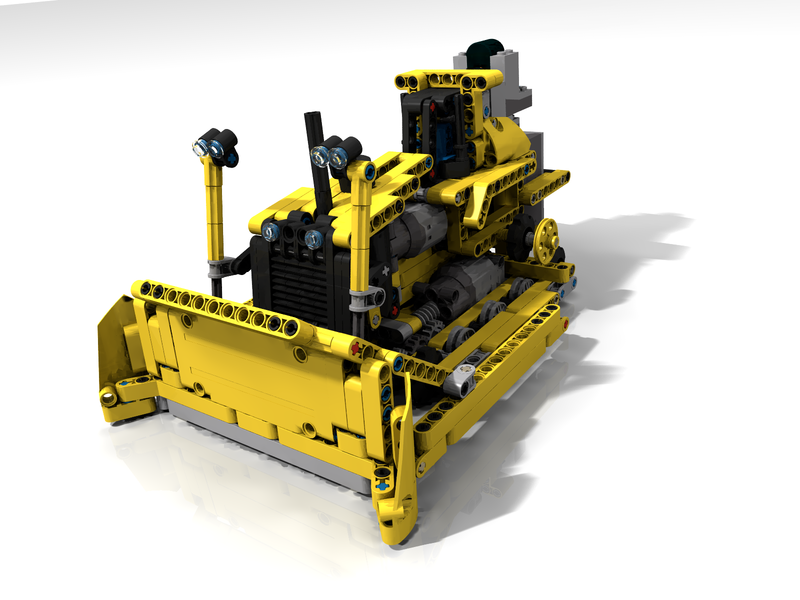 I added a new picture to the gallery with the complementary parts needed to build the model. Have fun ! I already own 8293 Power Functions Motor Set, it means that I have the battery set and M-motor which I can reuse. However if I understand correctly, servo motor is rather needed for steering, right? Well, most of the models are built with a servo for steering, so buying one might be a good choice ! thank you very much for this expression..